Bickford of Overland Park is a small, homey community. It's very fortunate that it doesn't have an institutional feel at all, it's very well-cared for and nice. The staff members are wonderful. We interacted with them frequently because my father needed a high level of care, and they were fabulous, very skilled, personable, welcoming, and made my parents feel very good. It's really a great place. The single rooms were large, so they were able to bring several pieces of furniture from their homes, which made it homier. The bathrooms are really nice clean since they provide cleaning and laundry service, which is wonderful. The activities director is named Amy, who is really bubbly and a lot of fun. My parents are really happy there. They have musical events that they go and listen to, and enjoy their private time, then go down for meals. It's a good place for people who are cognitively intact and those who have some older characteristics when they start to slip a little bit. They're having difficulties because they recently lost a couple of their cooks and hired a new one, so the food is not a highlight but it's nutritious and adequate. My husband is in Bickford of Overland Park. The place is very nice. When you walk in, there is a very lovely lobby where you can look into the dining room and see people rolling around in their wheelchairs or walking. It is a nice vision when you go in. It is pleasant, and people seemed happy. Bickford of Overland Park was good. I really like it. It's another one that we are considering. They have very comparable amenities like tours, transportations, and night outs, and they bring in entertainment. The rooms are quite large. Bickford of Overland Park is an older facility that seems pretty well maintained. The dining area is very well organized. It's kind of someone's living room. Bickford seemed nice, but they didn’t want me to go there. They had one availability at that time. It’s clean, fine, and a good place. Be very careful in committing to this organization. We put a monthly payment down to hold a room--no agreement was signed. Within 5 days a major occurrence made the placement there impossible. While the representative was very understanding, she indicated that we had to deal with manager--who did not return calls. Finally after about 70 days did receive some refund--but they kept $1000.with no explanation. Bickford’s price is reasonable, and my father is happy with it. The people do their jobs. Overall the facility is much better than the other facility we visited. It’s a nice place to be. There isn't a smell, and the food is much better, which is a big deal for him. I think they are taking care of him pretty well, too. Bickford of Overland Park seemed like a wonderful place to live. The rooms were of a good size and rectangular. I went at about 5:00 in the evening and the dining area just seemed a little dark to me. On tour are promised all of these activities for your loved one with Alzheimer's, never do much more than have them pretend to fold laundry. Beware -once you lose your loved one they will not return any phone calls regarding the monthly fee that was paid in advance of the next month. They cashed the check for over $6,000 the day after the death. My mother is in Bickford. It is a highly personal decision based on what her situation is and what we feel that these folks will be able to do. It has a lot to do with the people and the staff that we met and how we feel that their programs and their staff will work for my mom. She has only been there for about six weeks, and she seems to be happy there so far. She gained a little bit of weight, so I think she likes the food, and she has not had any subsequent falls, which is why we moved her from the independent living. They are keeping much better track of her medically. She is also diabetic, and I think they are watching that. They are watching what she is eating. They make sure that her diet works for that, and they make sure that she gets the medication that she needs. She is in a point where she needs some assistance in living because of her memory issues, and I believe that these folks are doing a good job with it. Would not recommend this facility whatsoever. When the new Director (Dean) was named the services went way south in a hurry. Good luck getting him to return your phone calls. Had my mother there for four years and moved her to a much improved memory care unit. We chose Bickford in Overland Park, Kansas. We are very satisfied. They have been so helpful in helping my father make the adjustment. The room is very spacious, and my father has a large, bright window that is just wonderful.It just has everything in the assisted living. My dad is a great eater, and he just loves their food. The kitchen supervisor came to see him, interviewed him, and asked him what he liked, and my dad thinks the food is wonderful. He was sick for a little bit. He had a wound injury from a fall when he moved in there, and when they were treating that, he just didn't feel like going to the dining room a couple of times, so they came down and said, "What would you like?" They brought him hot soup and made him feel better, so they are wonderful; it is a very personal service. Their social activities are very good. He is out for bingo and the other things that they have planned. Leaving your home is a difficult time, and it took him a little while, but the activity director is just like a pied piper and gets you involved in things, so he is active now. My mother-in-law has been situated in assisted living at Bickford Place for two months now. The room seems big enough and pleasant. The dining room is just a dining room; there's nothing different, unique, or special. Most of the tables accommodate four people, and some of them accommodated a few more. As for activities, they seem to make an effort at this place to have entertainment or something everyday, e.g., bingo, somebody coming in to entertain them, and fixing popcorn for them to watch a movie on TV. Security seems to be fine. My dad is in Bickford. The staff is great. They call me when my dad has any kind of incident -- if they change his medication or if he has a fall, anything -- they call me right away. The apartments are nice. They are roomy and very clean. The dining room is very small. The place that he comes from originally, they get to choose what they want to eat. The only thing that I don't care about this is that they just cook a meal and that's it. They don't really have a choice, but I think the food is good because I have eaten there a couple of times. My father has dementia, and he is terminally ill, so he doesn't do a lot of activities, but they have lots of activities. I chose it because I need something that is close to my home, and the director there is so caring and very concerned. She works with me, and I am really impressed overall with the place. It is a locked facility and people like me have to know the code to go in so I don't have to worry about him wandering off like he did before. I am happy with it. 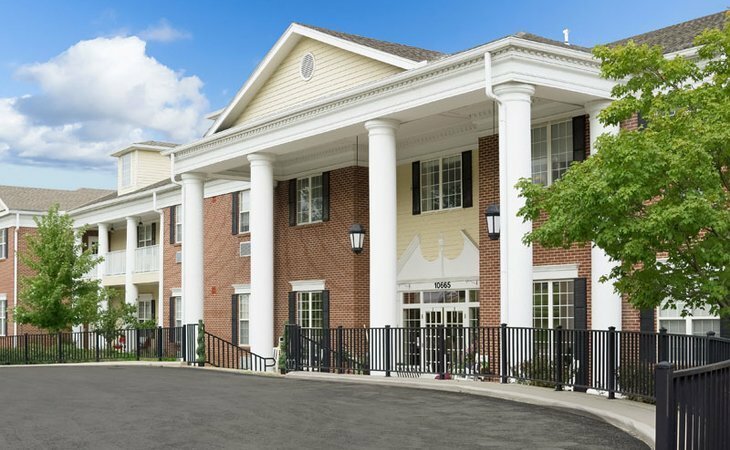 I chose Bickford because I wanted an assisted living facility that has memory care too. My dad has a pretty small room, but that is just fine. His dementia is pretty advanced so it is perfect for him. The food is fine; he likes it. As far as improvement is concerned, I think all of them have some room for improvement. The cleaning of the room and the bathroom can be a little bit better. For the most part, the staff that they have is not over the top, but they're fine. Some of them are very knowledgeable. Though I didn't see a lot of the staff because we go during the day, and we are not sure what exactly is going on in the evening; however, overall, they are fine. Based on my visit, it appeared to me that the staff of Bickford of Overland Park enjoyed their work. The people working there were good at what they do. I noticed that they had a nice courtyard. They even had an activities director. They also had many small activities and small groups. Among of the things they had were spiritual activities, musicians, and entertainers who would come in. This facility is fantastic,the staff from owners and Director to the janitorial personal are not just caregivers, they are loving, compassionate and give the best care imaginable! My husband of 47 years has been a resident there for over 17 months,due to severe progressive vascular dementia and I thank God every day that he has all of those guardian angels to give him the care I am unable to.I know there will be a special place in Heaven for each of them! I went to Bickford of Overland Park. The courtyard in between the memory care and the main place is probably one of the best outdoor areas I have ever seen. It has a winding garden, so you could go out there in your wheelchair. However, the memory care has a smell inside. The one thing I liked about Bickford of Overland Park is that there is a small tub or a bin put together for each resident (with the help of the family) of some interesting things that they would like. If they're agitated or bored, they would pull out these baskets, which is personalized to that resident, which I think is very clever. The staff members were good, accommodating, and followed up. Welcome to Bickford of Overland Park, one of Kansas's premier assisted living and memory care communities! Bickford of Overland Park is conveniently located on 10665 Barkley, so please, stop on by any time. We invite you in and welcome you home to our Overland Park senior living community. At Bickford of Overland Park, we offer premier memory care and assisted living services. The fullest expression of assistance comes with an intimate understanding of our residents at Bickford of Overland Park. Each resident of our Kansas assisted living home is unique, as are the services they require, and the manner in which they wish for them to be met. At our Overland Park senior community, we also know firsthand the confusion that memory loss creates in relationships with loved ones. That's why our Alzheimer's care community strives to make every activity intentional and personally driven by each individual’s life story. Nothing can replace home - this we know at Bickford of Overland Park. The smells that waft through the open door, the tattered edges of the overstuffed chair in the living room, the faded photographs on the mantle, the memories…lifetimes are built on these things; happiness dwells in them. At Bickford of Overland Park assisted living in Kansas, we don’t ask you to give up your home, your treasures, your memories. Instead, we want you to bring the pieces of the home you love into our Kansas assisted living and memory care community and make it yours. What should caregivers and potential residents know about Bickford of Overland Park?